Heat olive and sesame oils in a large skillet over medium heat. Add chicken, mushrooms and shallot; cook until chicken is browned, about 5-7 minutes. 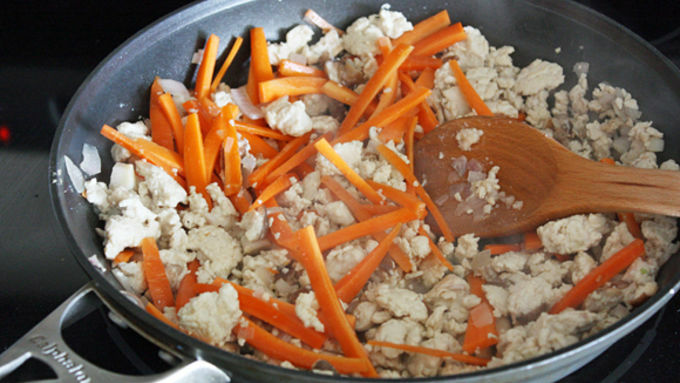 Add carrots and garlic; cook until carrots are slightly softened, about 2 minutes. Add sliced almonds, soy sauce, brown sugar, sriracha (add 1 tablespoon for less spiciness, 2 tablespoons for more), rice vinegar and grated ginger. Simmer until sauce has thickened, about 3-5 minutes. Spoon chicken filling into lettuce leaves. Garnish with sliced almonds and green onions. 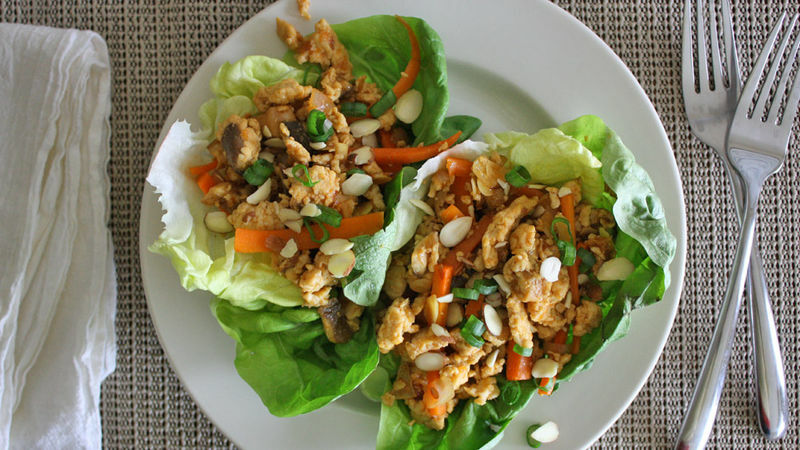 Lunch doesn't have to be the saddest meal of the day thanks to these delicious spicy, chicken lettuce wraps. If your lunch generally consists of either whatever’s left over from dinner the night before or an amalgamation of whatever’s in the fridge that’s about to die, then this recipe is for you. No more sad lunches! It's time to declare henceforth that lunch shall be tastier, healthier and satisfying-er. And it all starts with thinking, prepping and making ahead. 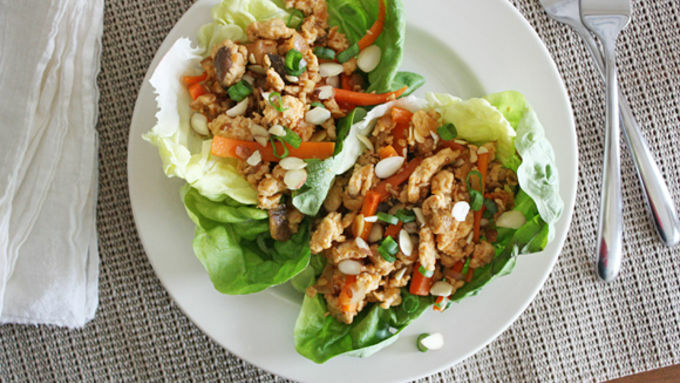 Let’s commence our quest with these Spicy Chicken Lettuce Wraps! So what we’ve got here are some yummy fresh veggies, ground chicken and a few seasonings and sauces like sriracha, sesame oil, soy sauce and garlic. This is a one-skillet situation, which makes it even easier and worth taking a few minutes the day before to make ahead of time. Oh yeah, can you smell the goodness already? Lunch is going to be INSANE! Now that you’ve cooked the chicken all the way through and the sauce has simmered and thickened, you’ve got two options: Put the filling in the fridge and save it for tomorrow, or commence the eating immediately. Or, do both! This recipe makes a solid stash of spicy chicken filling. Garnish your glorious lunch with a few green onions and sliced almonds and bada bing, bada boom, you’ve got the most un-sad lunch ya dun ever did see. This is one baby step closer to a lifetime of delicious lunches – take a gander below for a few more! Check out the rest of our make-ahead recipes for the easiest breakfasts, lunches, dinners, and even desserts.